The Blue Easel Gallery. She decided recently to step away from the running of the gallery to spend more time with her family. We were sad to see her go but the gallery will continue to stock a limited range of her prints, cards and gifts. Jennifer has been working as a professional artist for over 20 years. She gained her honours then post graduate degrees at Edinburgh College of Art followed by another postgraduate degree in education at Moray House. She taught art and design at Madras College, St Andrews for 3 years before giving up teaching to follow her heart and paint full time. 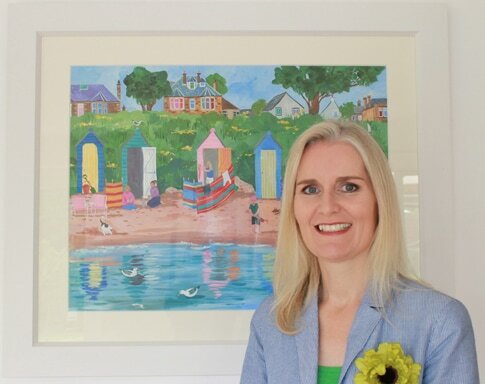 Since then, Jennifer has held a solo exhibition of her work most years in Elie, Edinburgh, St Andrews or Pittenween. Jennifer has been commissioned by many private clients as well as various organizations such as Scotrail, Scotmid, The Ladies Golf Union, Vinings Jubilee in Atlanta, Toyota and Esso. Her work can be found in the collections of The City Arts Centre, The Royal Bank of Scotland, Arts in Healthcare and the BBC. Jennifer's latest commission, instructed by The St Andrews Ladies' Putting Club was unveiled by HRH Princess Anne and will be on display at The St Andrews Golf Museum from mid April 2017. Jennifer has two main subject matters in her work so far - Edinburgh, where she has lived most of her life, and The East Neuk, where she has holidayed for many years. Over the years she has also painted many other places such as, East Lothian, Arran, Tobermory, Skye and Glasgow as well as Paris, Arles, Tuscany and Venice. Her favourite medium is acrylics but she also likes to use watercolour, pastel and coloured pencils.